1-CD with 10-page booklet, 21 tracks, Playing time 68:34 Minuten. 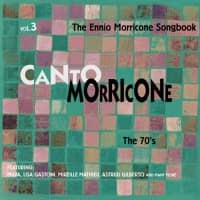 The second volume of our Morricone tribute is devoted to the composer's western songs and political ballads from the Sixties and Seventies. They told heroic stories, and fought for social justice in a dramatic, effective, yet always musical way. Christy is, together with Edda Dell'Orso, Nora Orlandi and Lydia Mac Donald, one of the most impressive female voices of the Cinema italiano. She has been featured on Canto Volume 1 and opens this collection with the revengeful Al Messico che vorrei from the 1968 film by Giulio Petroni, 'Tepepa'. It's a ballad about the social turbulence in revolutionary Mexico. Christy's high and clear voice returns with Corri uomo corri (Run man run) from the soundtrack of Sergio Sollima's film 'La resa dei conti (The Big Gundown)' in 1967. Raoul, singer on most of Francesco De Masi's western soundtracks and another well-known voice of the genre, performs the English language version of Da uomo a uomo, the leitmotif written by Morricone (with words by Attanasio) for the film of the same name by Giulio Petroni. Three very typical western ballads are included from Peter Tevis, an American singer who moved to Rome during the Sixties. A Gringo Like Me was from the film 'Duello nel texas' directed by Riccardo Blasco in 1964, Lonesome Billy was from 'Le pistole non discutono' directed by Mario Caiano in 1964, and Per un pugno di dollari was based on the main theme written by Ennio Morricone for Sergio Leone's hit from 1964. The catchy upbeat Mexican-flavoured title track Vamos a matar companeros is from the classic 1970 Sergio Corbucci western. It is justly considered a classic of the genre. Three more monumental songs belong here. They are performed by Maurizio Graf, perhaps the most famous Italian western singer, and they are Angel Face from 'Una pistola per ringo'. We also have the title song from its sequel, 'The Return of Ringo' as well as Eye For An Eye from the classic soundtrack of 'Per qualche dollaro in piu' directed by Sergio Leone in 1965. 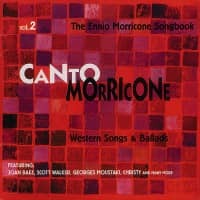 The second part of this volume of Canto Morricone features mostly non-western, political ballads. The spiritual U pa Ni Sha , sung by Rocky Roberts for the Sergio Giordani-directed TV series 'L'Uomo e la magia', dates from 1971. It's followed by Sergio Endrigo's classic La Canzone Della Liberta (words by film director Lucignani) from the 1968 film 'Alibi'. It was recorded later by Milva, among others. The 1969 mobster movie 'Gli intoccabili' gave us Ballad Of Hank McCain sung by Jackie Lynton, and the political trilogy The Ballad of Sacco And Vanzetti, written and performed by Joan Baez from Giuiano Montaldo's 1970 masterpiece 'Sacco E Vanzetti'. Scott Walker's magical voice dominates another version of this song, taken from his LP 'The Moviegoer.' 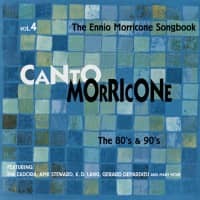 It is one of the few non-Morricone orchestrations presented in the 'Canto' series. Another is the French language version of the hymnic Here's To You by chansonnier Georges Moustaki. 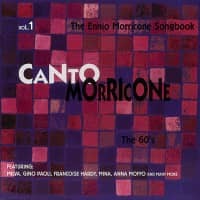 It was arranged by Hubert Rostaing, and makes an interesting comparison with the Joan Baez original included as a coda to our second volume of the Ennio Morricone songbook. Morricone's first film score was for the comedy 'Il Federale' in 1961. Three years later, he was hired by Sergio Leone to write the score for 'A Fistful of Dollars', which he wrote under the pseudonym Dan Savio. In stark contrast to American western theme songs, which were often folk-based, Morricone used a haunting combination of cries and a repeated whistled phrase in 'A Fistful of Dollars'. He then worked on Leone's trilogy of 'spaghetti westerns,' and those in turn led to offers of work from leading European directors. Among the best-known films to bear Morricone's trademark skills are 'Battle of Algiers' (directed by Pontecorvo in 1966), 'Big Birds, Little Birds' (directed by Pasolini in 1966), and '1900' (directed by Bertolucci in 1976). Altogether, Morricone has scored more than three hundred movies covering every conceivable genre. In the Nineties, he seems to be working as hard as ever, scoring 'Husbands and Lovers', 'City of Joy', 'Hamlet', 'Cinema Paradiso' ...and many others. Along the way, he has also composed several albums of non-film music, and had a #1 hit in England with Chi Mai, a tune he intially composed for the movie 'Maddalena' in the early 1970s, which was used again in 1981 by the BBC television series about the British prime minister Lloyd George. The tune was used yet again in the Jean-Paul Belmondo movie 'The Professional'. Customer evaluation for "Vol. 2, Western Songs & Ballads - The Ennio Morricone Songbook"